Ahsan Manzil situated at Kumartoli of Dhaka on the bank of the Buriganga, was the residential palace and the kachari of the nawabs of dhaka. It has been turned into a museum recently. It was said to be the Rang Mahal of Sheikh Enayetullah, a zamindar of Jamalpur pargana (Barisal) during the time of the Mughals. Having purchased it from his son Matiullah, the french made it their trading centre. Khwaja alimullah bought it from the French in 1830 and converted it into his residence, effecting necessary reconstruction and renovations. Nawab Khwaja abdul ghani engaged Martin and Company, a European construction and engineering firm, to make a master plan for their residence. The construction of the palace was begun in 1859 and completed in 1872. Abdul Ghani named it Ahsan Manzil after his son Khwaja ahsanullah. At that time the newly built palace was known as Rang Mahal and the earlier one was called Andar Mahal. Ahsan Manzil was pertly damage by a terrible tornado On April 7, 1888, particularly the Andar Mahal of the palace. Nawab Ahsanullah rebuilt the Andar Mahal and repaired the Rang Mahal using good quality bricks that were brought from Raniganj. The exquisite dome of the present Rang Mahal was interposed. Ahsan Manzil was badly damaged again by the earthquake of 12 June 1897. However, Nawab Ahsanullah had it repaired again. Ahsan Manzil is one of the significant architectural monuments of the country. Established on a raised platform of 1 metre, the two-storied palace measures 125.4m by 28.75m. The height of the ground floor is 5 metres and that of the first floor 5.8 metres. There are porticos of the height of the ground floor, both on the northern and southern sides of the palace. An open spacious stairway has come down from the southern portico, extending upto the bank of the river through the front garden. There was once a fountain in the garden in front of the stairs, though it does not exist today. The spacious north and south verandas of both the floors rest on semicircular arches. The floor is covered with marble. To construct the dome of Ahsan Manzil, the square room on the ground floor was given a round shape with brickwork in the corners. The room was then given an octagonal shape near the roof by squinches. This octagonal shape took the form of the drum of the dome. Finally, the kumud kali (buds of lotus) shaped dome was constructed by gradually slanting the eight corners to the peak. The dome is 27.13 m high from the ground. On the western wing of the first floor there is a spacious Jalsaghar with a Hindustani room on the northern side and four square rooms in the western corner. The vaulted artificial ceilings, made of wood, in the drawing room and the Jalsaghar, look very exquisite. The floors of these two rooms are made of wooden planks. On the ground floor there is a big dining hall and six square rooms in the eastern part. In the western side, there is a gigantic darbar hall and to its north is a billiard room. The floors of the dining and darbar halls are decorated with white, green and yellow coloured ceramic tiles. The famous strong room, where the valuables of the nawabs used to be stored, was the middle of the five rooms located in the western half of the ground floor. There are attractive wooden stairs in the room that is attached to the north of the room covered with the dome. The balusters were ornamented with vine leaves made of iron along the railing of the stairs. The wooden ceiling of the room, decorated with geometric designs, is very elegant. A visitor’s book bound in gold used to be kept by the stairs during the halcyon days of the nawabs. Distinguished visitors to the palace would note down their observations in it. The thickness of the walls of the palace is about 0.78 metres. The doorways are placed within semicircular arches. The inner doors had multi-coloured glasses and the exterior ones were of wood with designs. Wooden beams supported the roof of these rooms. The height of the two-storeyed inner house is slightly less than the Rang Mahal. Nevertheless, the wide southern verandas on both floors and the parapet on top offer a delicate look that is in harmony with the Rang Mahal. Iron beams have been used in constructing the roof. 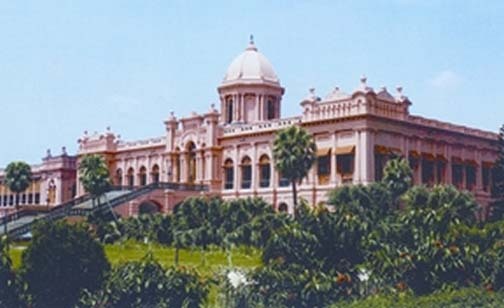 Ahsan Manzil, an architectural treasure, witnessed many historical events of Bangladesh. From the last part of the 19th century to the initial years of Pakistan, the Muslim leadership of East Bengal emerged from this palace. The nawabs of Dhaka used to conduct their court affairs here as chief of the panchayet (village council) everyday. Many anti-Congress meetings were held here under the initiative of Nawab Ahsanullah, a staunch believer in Muslim separate identity. Almost all the Viceroys, Governors and Lieutenant Governors of British India who visited Dhaka spent some time at the Ahsan Manzil. In 1874, Lord northbrook, Governor General of India attended an evening function here in the palace when he came to lay the foundation of a water works installed by Nawab Abdul Ghani. In 1888, Lord dufferin also accepted the hospitality offered at Ahsan Manzil. In 1904 Lord curzon, on a visit to East Bengal, stayed in this palace on 18 and 19 February to win public support for the proposed Partition of Bengal. Almost all political activities of Nawab Khwaja salimullah centred round this palace. Ahsan Manzil was the cradle of the All India Muslim League. With the decline of the nawabs of Dhaka, Ahsan Manzil also started to decline. 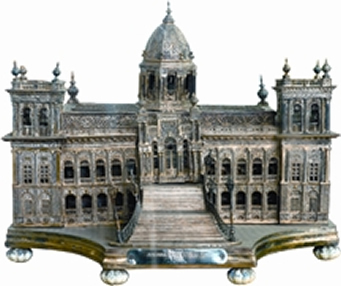 When in 1952 the Dhaka Nawab State was acquired under the East Bengal Estate Acquisition Act, it became impossible for the successors of the nawabs to maintain the palace due to financial constraints. Nawab Khwaja habibullah shifted his residence to Paribag Green House soon after the acquisition of the zamindari. The palace was on the verge of collapse in no time as successors rented out rooms without considering its dignity. Over the years illegal occupants turned the place into a filthy slum. Very good writing for about significant architectural monuments of the country.